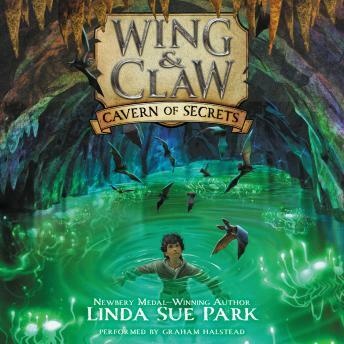 In the second installment of the spellbinding Wing & Claw series, Newbery Medal—winning author Linda Sue Park takes a young apothecary hero to new heights of danger, exciting adventure, and intriguing botanical magic. Raffa Santana has spent all winter hiding in the harsh wilderness of the Sudden Mountains, and now it’s time to return home. Home, where his parents will help him fight back against the vile Chancellor who has captured and altered the wild creatures of the Forest of Wonders. Home, where Raffa’s beloved companion, Echo the bat, will recover from his mysterious sickness. To get there, Raffa must make a treacherous journey across Obsidia. Along the way, he will discover a luminous plant that might be the key to saving the creatures stuck in the Chancellor’s grasp… if only Raffa can unlock the plant’s secrets and deliver the cure to the captive animals. Cavern of Secrets masterfully explores one boy’s responsibility to his friends, family, and the wider world.